Our country needs a secretary of state who will guide foreign policy with a steady hand, not place profit ahead of diplomacy. We are taking a step today that is fraught with untold danger. We are going into war upon the command of gold. We are going to run the risk of sacrificing millions of our countrymen’s lives in order that other countrymen may coin their lifeblood into money. And even if we do not cross the Atlantic and go into the trenches, we are going to pile up a debt that the toiling masses that shall come many generations after us will have to pay. Unborn millions will bend their backs in toil in order to pay for the terrible step we are now about to take. By our act we will make millions of our countrymen suffer, and the consequences of it may well be that millions of our brethren must shed their lifeblood, millions of brokenhearted women must weep, millions of children must suffer with cold, and millions of babes must die from hunger, and all because we want to preserve the commercial right of American citizens to deliver munitions of war to belligerent nations. Norris, La Follette and the courageous foes of US involvement in World War I—most of them Midwestern progressive populists—recognized the profound danger that arose when US foreign policy became intertwined with the pecuniary demands of plutocrats and profiteers. It is not just in matters of war and peace that those dangers arise, of course. When CEOs are calling the shots, everything from trade policy to energy policy and responses to climate change are warped by unenlightened self-interest. The potential for the corruption of America’s foreign policy expands dramatically when businessmen with international interests assume positions of power. This is one of the reasons Massachusetts Senator Elizabeth Warren, Wisconsin Senator Tammy Baldwin, and 21 of their colleagues, in December, urged President-elect Donald Trump to follow the advice of the nonpartisan Office of Government Ethics and divest from his business holdings before taking office. That was a sound argument for how Trump, whose candidacy was opposed by the majority of Americans, might bring a measure of legitimacy to his presidency. Not only does Tillerson have billions of dollars at stake with sanctions on Russia, his company has been under a formal investigation by the Securities and Exchange Commission for inaccurate accounting practices that affect global climate regulations. Our country needs a secretary of state who will guide U.S. foreign policy with a steady hand, not place profit margins ahead of diplomacy. Pocan is right. The nomination of Tillerson to serve as secretary of state puts a dollar sign on the American flag. To propose that this plunderer be allowed to represent the United States on the global stage is to assert that this country’s first and only foreign policy is crony capitalism. That is an insult to our best history, and a dangerous threat to our future. And, of course, he was right to be concerned. Lives were at stake then. And lives were lost because policies based on greed and self-interest trumped common sense and humanity. The dollar diplomacy of Donald Trump and Rex Tillerson again threatens lives—American lives and the lives of innocents around the world. 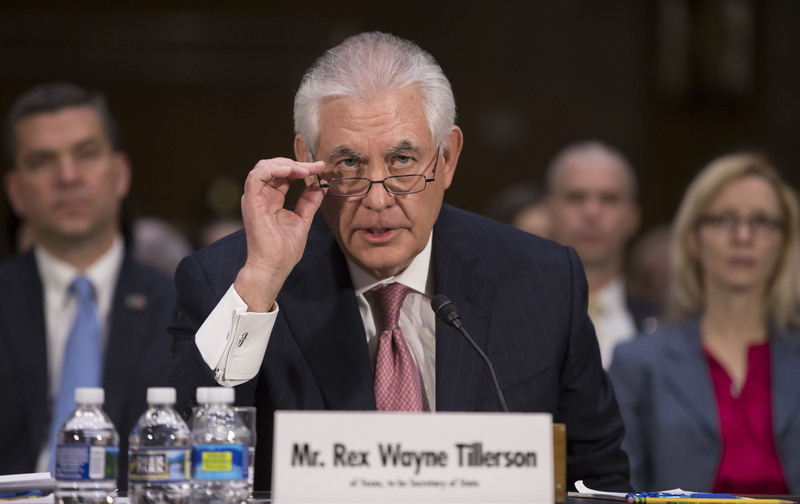 Trump’s nomination of Tillerson to serve as secretary of state renews an old danger. It should be rejected as the looming menace that it represents.